I don’t make it a secret that I occasionally play favourites. For the longest time it was Sophie, because she was my number one girl, the prettiest of the pretty and her silver hair looks remarkably beautiful with anything that she wears. Then came Eden Mouse, who’s the little girl at heart who reminds me so much of myself as a child. Except for the fact that I didn’t have an obsession with pink. I still don’t, I just like having an obsession with pink for her. Plus – pink is such a prevalent colour in the doll world (perhaps we have Barbie to thank for that?) and so easy to find shoes in all the shades of pink for her. But the one who has captured my heart, in more ways that one? She will not be a surprise to anyone who follows me on Flickr or Instagram. It’s her frizzy hair and the 70’s charm that cinched it. I didn’t even go into the Blythe world wanting a dark haired Kenner. In fact, I was so convinced that I’d be getting a blonde Kenner after Emmalynn (my redhead) that I kind of dismissed the idea of a brunette or raven haired beauty. From the moment I saw her first photo pop up on Flickr to the moment that I got to hold her in my hot little hands, I was a goner. If someone were to ask me right now if I were to have to give up all of my Blythes except for one, she would be the one that I choose. I know realistically that she’s “just” a doll. 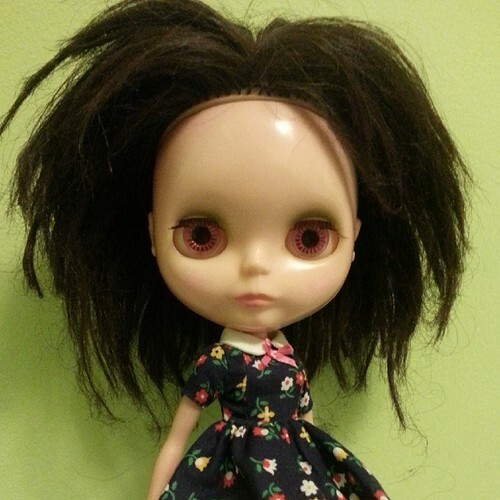 Just a very old, very charming plastic doll who was in a sad state when I got her, what with her missing legs and frizzy hair style. Yes, she cost me quite a few pretty pennies but I don’t regret it. And I love putting her in new dresses and other clothing that comes in through the mail because she looks fantastic in pretty much anything. When I first started in the Blythe hobby, I never thought I would own one Kenner, let alone three. And even though she wasn’t what I expected in my dolly hobby (because a brunette Kenner was just not on the radar), I’m glad she’s come into my life and taken me by surprise. Sometimes you need a little surprise joy in your life.